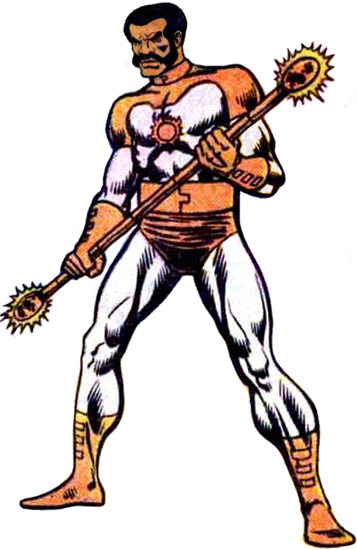 Mon-Tog is trained in Kree military combat and claims to have never been defeated, before he met Black Bolt. He commands a small army of Kree warriors, similarly combat trained and armed with hand-blasters. Enhanced Abilities: As with any Kree, Mon-Tog has enhanced strength, endurance and durability. Neuro-Lance: Mon-Tog uses a Neuro-Lance, which can shock a victim's nervous system to the point of death. As the "War of the Three Galaxies" drew near, Mon-Tog was stationed as commander of the Kree outpost that supervised the planet Stent, offering limited support to the City-Keepers against their enemies, the Demon-Rebels. He may also have directed the conversion of a number of humans on Earth into Kree slaves, who were to build bombs to weaken the nations of Earth, preparing it for conquest by the Kree. A short time later, a group of Demon-Rebels, led by Warkon, and accompanied by the Inhuman Royal Family (and Falzon), were tricked into entering a ship which transported them to the Kree Space Station Web. They encountered Mon-Tog and attempted to pose as City-Keepers, but Skornn, of the real City Keepers, sent a message revealing the truth. The Inhumans and Demon-Rebels battled the Kree who tried to capture them.